We are glad to announce that the next smart city conference Smart City for the Citizens 2019: Data and AI as game changers for the cities will take place on May 23, 2019 in Estonian National Museum, Tartu. This year's program will mostly focus on data and AI and how they are the game changers for the cities both today and in the future. We are looking forward to many interesting speakers and lots of networking! We will start with a smart city tour combined with welcome reception already in the evening of May 22 and have a networking dinner on May 23, so you will have more time to spend in the city of good thoughts! 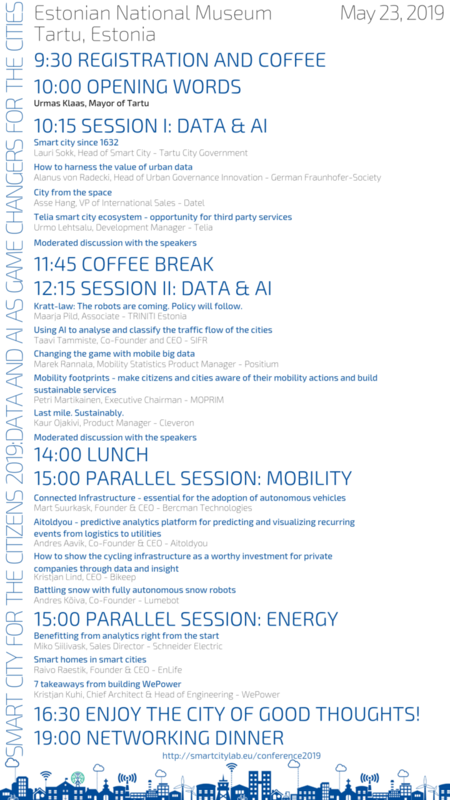 In the afternoon of the conference, two parallel sessions will be held: one is focusing on smart mobility solutions and the other on smart energy solutions. In the registration form, please choose which one you would like to attend. Participation fee includes smart city tour and welcome reception on May 22, conference and networking dinner on May 23. If you have any additional questions, feel free to get in touch: gerttu@smartcitylab.eu.